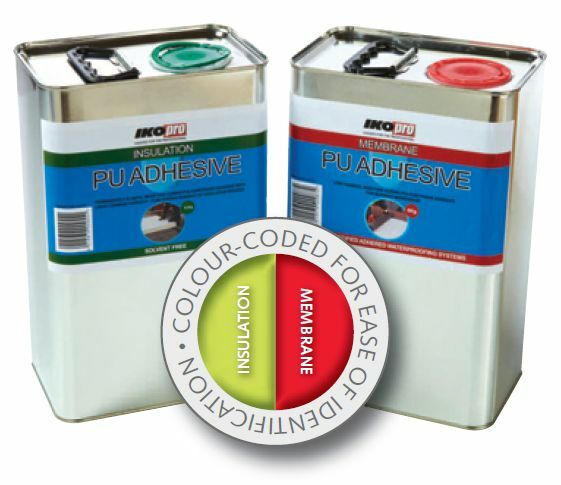 A single component, high-foaming, solvent-free polyurethane adhesive, specifically developed to securely bond a wide range of insulation boards to most substrates. Use directly from the container. Coloured green for easy identification. Independently tested and approved by the BRE. Coverage: 30–35 m² per tin, depending on surface porosity. Coverage rate should be doubled to all perimeter and exposed edges. 4 x 15 mm continuous beads per 1200 x 1000 mm board at 300 mm centres to main roof. 8 x 15 mm continuous beads per 1200 x 1000 mm board at 150 mm centres to perimeter edges. Open time: 15 minutes at 5°C; 7 minutes at 20°C; 4 minutes at 30°C. Curing time: Dependent on ambient temperature and humidity but is typically 60 minutes at 5°C; 30 minutes at 20°C.